I believe I described skeleton, right here on TheExpeditioner.com, as “extreme headfirst sledding, in tights, somewhere within Avatar’s Pandora.” I still hold that to be true (stay tuned, there might be some tickets for these shenanigans in my future). 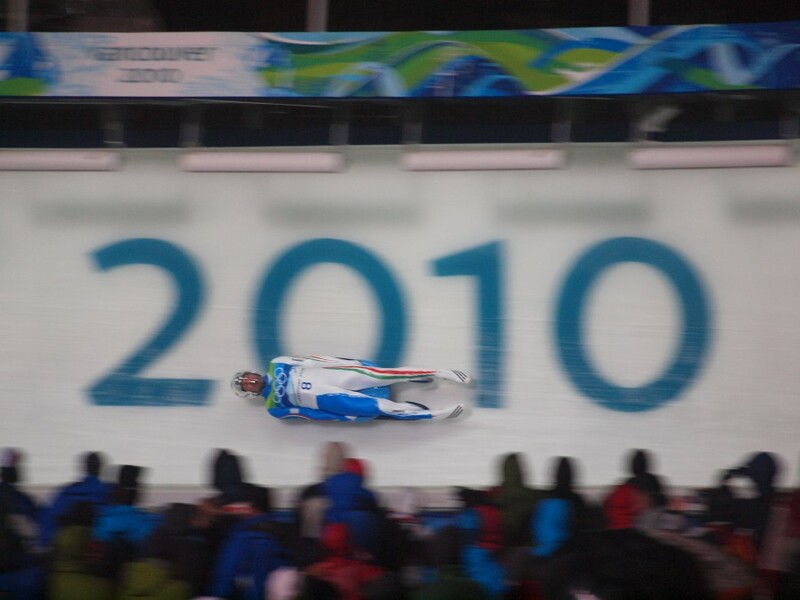 So take that description, replace “headfirst” with “feet first,” and you have the most accurate picture of the sport called Luge. I snagged some tickets to the first two qualifying rounds to see what in the world this is all about. Actually, Luge has had quite a lot of the headlines at the beginning of the Olympics, and not because of the tight outfits the lady competitors wear. In my last post I wrote about my time exploring Vancouver all day. Because of that, I missed any news from Olympicville. 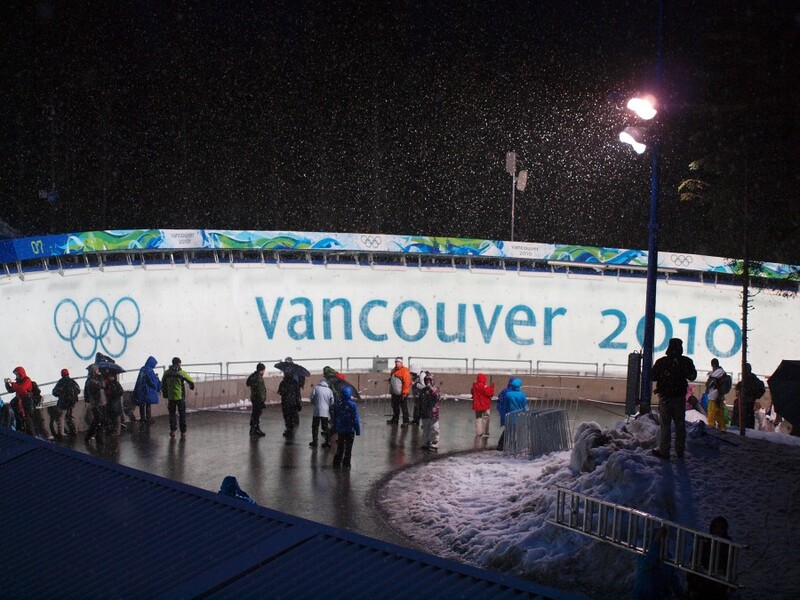 It was only an hour previous to the ceremonies when I learned of the tragedy that happened on the Olympic luge course. The death of Georgian luger Nodar Kumaritashvili will forever remind us of the inherent risks involved in highly competitive, high-performance sports. There was a moment of erupting cheers in support of the Georgian athletes at Robson Square which will be one of those special moments I will always remember. In fact, right now, there is a giant statue of the Olympic rings in the middle of Whistler’s village that has become a memorial to the athlete, with flowers, candles, and a picture of him. This outpouring of sympathy from people completely unconnected to him or his country is a reminder of what the Games are about. After the slog through the watery snow that makes up Whistler-Blackcomb’s lower mountain and the airport-intrusive security, I finally made it the track, which was impressive itself. I know it has been the source of much controversy of late (too dangerous? Driver error? ), but I’m talking about the physical track. This ribbon of icy concrete traces 4,507 feet of mountainside, now reduced to about 4,000 feet for the lugers, and drops over 500 vertical feet in the process. The mastermind behind this design has the athletes reaching speeds my Pontiac won’t even think about (really). My only experience with luge is watching it on T.V., on the Olympics (not like ma and pa throw luge watching parties like the Superbowl). The racers gracefully glide along the finely manicured path, rolling up the banks, and skidding to a finish with ease. Well, T.V. has it all wrong, as usual. I was blown away at the sheer speed at which they passed me, the sound of the sled rails on the track, the violence of the force these things generate. This isn’t a finely edited joy ride down a slope, this is a sport seemingly always teetering on the brink of a disastrous accident. Oh, and that graceful stop we’ve all been seeing, before they shortened the track, people were outshooting the finish and being launched into the foam pit that sits at the end of the track (on a fairly regular basis according to the gentleman I was chatting with at the race). Needless to say, I was quite impressed at the luge. The discussion around the village is still: “is the track too dangerous?” I have a feeling that question is just one of those anomalies that ends where it begins, because what I witnessed is a beautiful, crazy sport that is dangerous in and of itself. 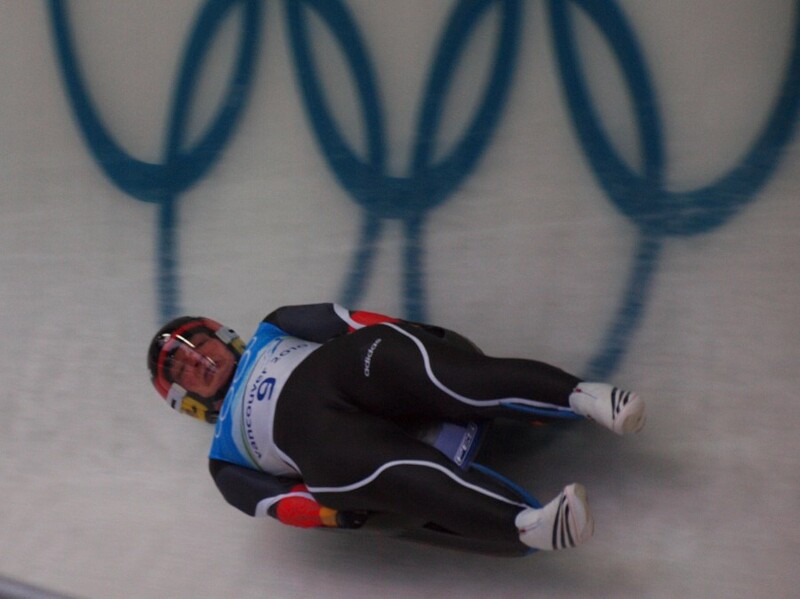 Where was luge when I was growing up? If you put Gassy Jon in a tube of ice with a sled, I bet he wouldn’t ever be stopped.